I included this review in the same issue as the SINNER review on purpose, because everything that SINNER fails to do with their new album, GRAVE DIGGER succeeds in pulling off. Although historically GRAVE DIGGER has never been much more than a cult act for die hard fans of the "Teutonic terror" scene, they have still been able to release a couple of very powerful records that have earned a place in metal history. 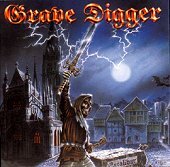 "Excalibur" has all the makings of a disaster but somehow GRAVE DIGGER manage to dodge the bullet and have a very good album to show for their effort. The first thing that should have tripped them up is that this is a "theme" album that takes the plunge into being a full fledged "rock opera". Many bands give this idea a whirl but only a handful make it work. Add GRAVE DIGGER to that handful. Another thing that should really screw up the works is that they chose a cheesy story like King Arthur and the Knights of the Round Table to put to music. They don't actually pull this off, but they do manage to give it an "epic" flavor and epic has always gone over well in heavy metal. Another trap they walk straight into is including a ballad. In this case it is "Emerald Eyes" which is the story of Arthur and Guinevere's love. But, again, they compensate for this weakness by following up the ballad with one of the strongest (and by far most epic) tracks on the CD "Avalon". The aspect of the album that should screw them up the worst is that they decided to use a more accessible vibe on this CD than they are known for. Yet again this seeming mistake works in their favor because the end result is a more progressive sound that marks a real advancement for GRAVE DIGGER... Not unlike what New York's RIOT accomplished oh so many years ago. All in all I'm pretty impressed with "Excalibur" and real metal heads with a passion for this kind of music will be thrilled. Be aware that if you can find the limited edition digipak version of this album be sure to grab it. It comes with a bonus track that is harder hitting than anything on the regular release.